This resort is currently under construction and is expected till about 2019. Builiding 8 was finished in 2018. The pool, fitness center and hot tub are all completed. The levels of noise can vary from day to day from heavy equipment to finish carpentry. Red dirt can settle on the lanai decking but cleaning supplies are under the sink for guests to use if need be. Construction hours are Monday - Saturday 8AM to 5PM. The regular occupancy for 8J is 8. Guests are obligated to disclose the actual number of occupants prior to arrival. Parking: This unit does have a one car garage for the guests to use. There is also one outdoor assigned parking space in space 83. Parking is also allowed outside the complex on Kaihuna Plantation road. Beautiful new unit. Very well equipped kitchen (cutlery, plates, silverware, cooking utensils, storage containers...you name it!) and well stocked with laundry detergent (stack washer and dryer). Very well appointed with granite counter tops, 2 king beds, one bedroom with 2 single beds, 3 baths, patio furniture, new appliances including the Boasch dishwasher. The unite had AC but we never needed it. Very quiet, on the golf course with a view to the ocean. Easy walk to the mexican restaurant down at the golf club, a couple hundred yards away. Pool very close by. We didn't use the garage (where there was also beach chairs, a couple of bikes and other beach stuff) but parked in the unit parking space. The couch was also a Hide-a-bed. It was great being so close to everything in Poipu and Koloa. Great restaurants very close by - Merriman's, The Beach House, Eating House 1849 and Brennecke's. Enjoyed watching the sunset during dinner at Brennecke's, then we walked across the street to the beach to dip our feet into the ocean and found a couple of large sea turtles. A wonderful way to relax. Enjoyed how the sunrise paints the clouds in our westerly view of the ocean. Beautiful sunsets!!! Come and Enjoy this 2018 built Condo at Pili Mai! 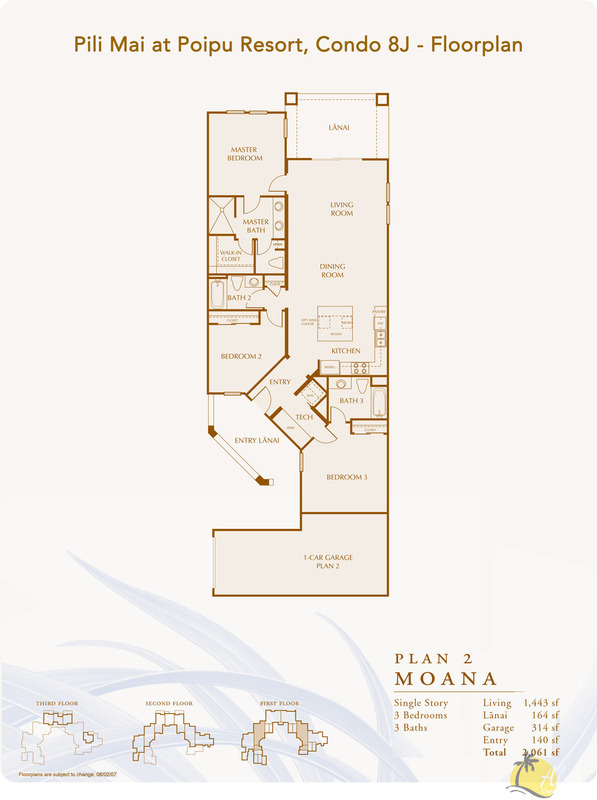 The floorplan offers spacious living with 3 bedrooms and 3 full bathrooms with accommodations for up to 8 people. Dressed in soft hues of blue, the beach vibe of this unit will instantly put you into the a mode of relaxation to get you started on your dream vacation! You will be treated to upgraded finishes which include wood flooring, granite, marble and travertine. Sitting on the lanai will take you away as you glare the expansive fairway views and distant ocean vistas. The sparkling pool, the hot tub and fitness center add to the experience you are sure to love. You will not be disappointed choosing this special unit for your Hawaiian destination! You will want to come back again and again! This is a new development in sunny Koloa. Very convenient to shopping, restaurants and the beach. The common pool area is really nice and spacious. The condo itself was very well furnished, and the kitchen had every appliance you might need. As a coffee aficionado, I like to enjoy the great local coffee, so having a grinder in the kitchen was much appreciated. We would happily return to this unit. Beautiful new unit. Very well equipped kitchen (cutlery, plates, silverware, cooking utensils, storage containers...you name it!) and well stocked with laundry detergent (stack washer and dryer). Very well appointed with granite counter tops, 2 king beds, one bedroom with 2 single beds, 3 baths, patio furniture, new appliances including the Boasch dishwasher. The unite had AC but we never needed it. Very quiet, on the golf course with a view to the ocean. Easy walk to the mexican restaurant down at the golf club, a couple hundred yards away. Pool very close by. We didn't use the garage (where there was also beach chairs, a couple of bikes and other beach stuff) but parked in the unit parking space. The couch was also a Hide-a-bed.It was great being so close to everything in Poipu and Koloa. Great restaurants very close by - Merriman's, The Beach House, Eating House 1849 and Brennecke's. Enjoyed watching the sunset during dinner at Brennecke's, then we walked across the street to the beach to dip our feet into the ocean and found a couple of large sea turtles.A wonderful way to relax. Enjoyed how the sunrise paints the clouds in our westerly view of the ocean. Beautiful sunsets!! !